The layout containers in WPF do not automatically provide scrolling support. 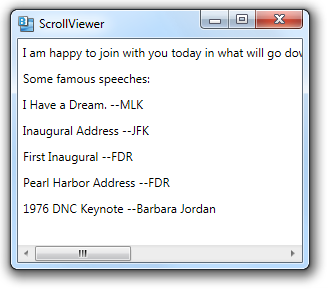 To scroll the content in a container, however, you can wrap it in a ScrollViewer control. 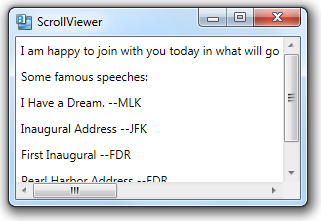 Notice that we’ve set the visibility of both scrollbars to Auto. 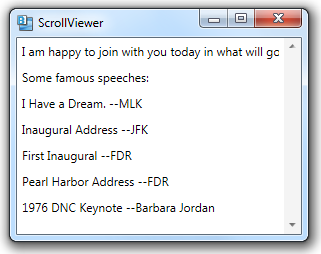 By default, though, the horizontal scrollbar is disabled and the vertical scrollbar is visible. You can set the HorizontalScrollbarVisibility and VerticalScrollbarVisibility properties to one of the following: Disabled, Visible, Auto or Hidden.